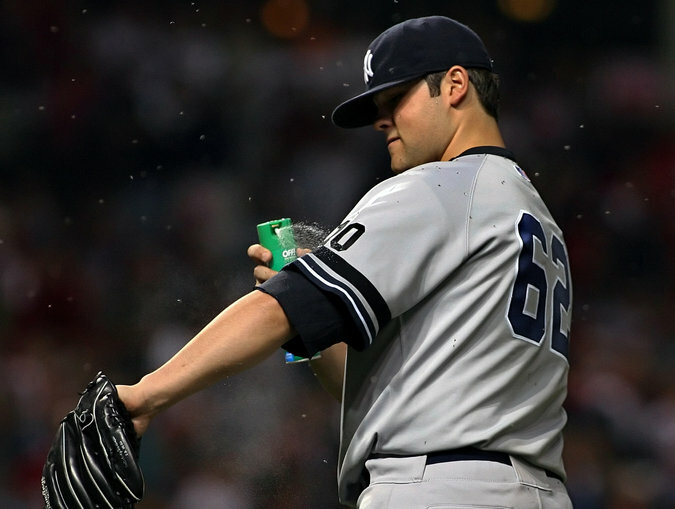 Bug spray had no apparent effect on the midges that besieged Joba Chamberlain in Game 2 of the Yankees’ 2007 division series with Cleveland. He threw two wild pitches and allowed the tying run. The signing of a journeyman pitcher to a minor league contract does not ordinarily raise much interest in the hot stove league. But when the pitcher is Joba Chamberlain and the team signing him is Cleveland, the jokes practically write themselves. Chamberlain has spent nine years in the league, mostly as a mop-up man, but an incident in Cleveland in his first season created the most indelible image of his career. Just 21 years old for most of the 2007 regular season, Chamberlain pitched 24 innings of middle relief for the Yankees and gave up only one earned run. The Yankees took great care to protect his arm, and his E.R.A. was an improbable 0.38, the lowest in almost 100 years for a player throwing that many innings.